I believe in the raw, authentic moments that are the foundation of your love story. I believe in the kind of love that takes your breath away when you look into their eyes. That crazy feeling that has you running, side by side, hand in hand, fearlessly embracing every adventure ahead. I believe in the couples that understand their love story has no final destination. The walk down the aisle isn’t the end; it’s the beginning of life’s greatest adventure. Your love will carry you across oceans, over mountains, and through the valleys that lie ahead. I believe in your love. I’m a lover of light, love, and any adventure that life has to offer. Nashville, TN is my home, but I’ve celebrated my love and passion for photography wherever I can! From the rolling hills of Tuscany to the dunes of Morocco, I’ve been chasing the next greatest love story. And now it’s time for yours. I am eager to be a part of your engagement, elopement, wedding- frankly anything you have in mind! As long as there’s a celebration & love to capture with my camera, I’m ready for the adventure. One of my absolute favorite things about being a photographer is the connection I make with the beautiful people I am lucky to work with. It is so gratifying to work with someone in such a way that they trust you to capture multiple life milestones with them. From day one, Alexia knew she wanted her engagement session to be in a local cotton field outside of Nashville, TN. Seriously, she was a girl with a plan!! I absolutely loved her determination to get the perfect shot, and I was dedicated to capturing her engagement session to Daniel perfectly! While I primarily photograph engagements, lifestyle sessions, and weddings- I have always loved to shoot in-home newborn sessions. I adore capturing the rawness of a child’s first few weeks in this world and witnessing the unfailing love and commitment that surrounds this precious new life. It is almost overwhelming to witness these new parents hold their sweet child, and silently, but confidently, vow to protect to their newborn baby. Most of the time I personally write the blog posts about my beautiful clients. All of the time, actually. But this one time, I wanted to let them speak for themselves. In the short time I spent with Billy and Anna during their rainy, Nashville couples session, I cannot even begin to count the amount of “I love you’s” that were exchanged. 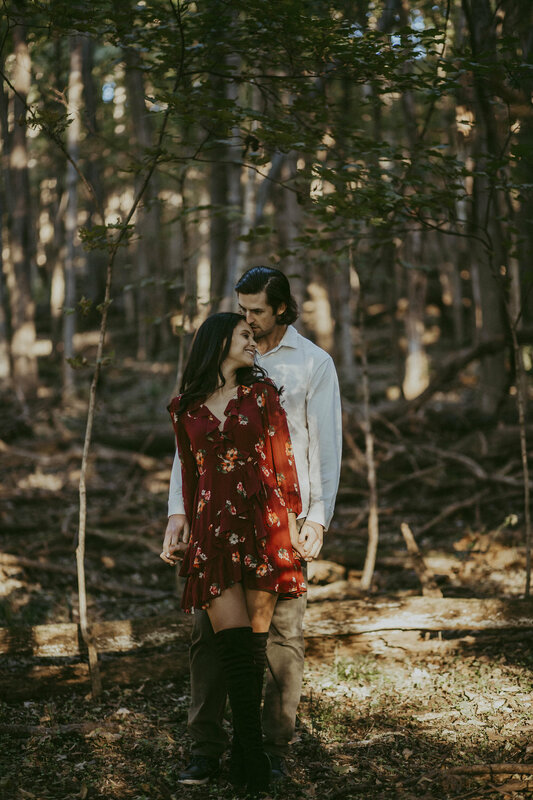 Maggie did an amazing job for our engagement shoot. She helped me relax whenever I started to feel awkward, and she made the entire experience wonderful. Our pictures turned out gorgeous, and we couldn’t be happier with them. Maggie was recommended to me by our original wedding photographer, who had to cancel just a few months before our big day. She graciously stepped in and made our wedding such a breeze! When Maggie sent us our pictures from our wedding, I was truly amazed. She was able to take so many candid shots, and captured everything about our wedding, from the big family photos, to the little details I never want to forget. I would definitely recommend Maggie to anyone I know! We had such a great time working with Maggie! We needed headshots for our website/socials and everything from the booking process, to the actual shoot, and the images she captured more than exceeded our expectations. She was professional, accommodating (we had our 2and3 year olds with us! ), and her talent really showed when she was able to capture great images - quickly. I recommend Maggie Reade very highly! Maggie photographed our wedding and we couldn’t be happier. She captured our intimate wedding perfectly and I am so glad we have the beautiful pictures so that we can remember our special day forever. Maggie is so talented and we highly recommend her. Every couple deserves pictures to make special moments last forever and with Maggie you are guaranteed to get that. Maggie is a fun, passionate and talented photographer. She asked lots of questions to get a sense of what we wanted. Was very prompt in answering any questions we had, and above all made the shoot fun. She captured us being ourselves in the best way. I cannot recommend her enough.